Human lives and wellness depend on medical equipment uptime. A malfunction or unscheduled downtime can lead to treatment delays, penalties to the service organization, or in the worst case, harm to a patient. 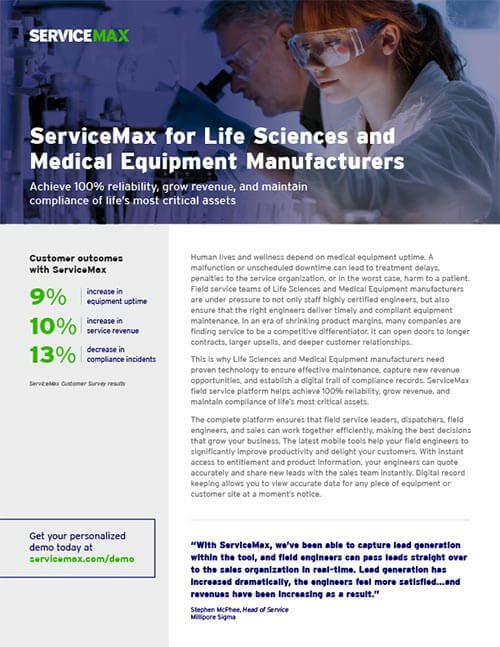 Field service teams of Life Sciences and Medical Equipment manufacturers are under pressure to not only staff highly certified engineers but also ensure that the right engineers deliver timely and compliant equipment maintenance. In an era of shrinking product margins, many companies are finding service to be a competitive differentiator. It can open doors to longer contracts, larger upsells, and deeper customer relationships.